There’s a moment of cinematic perfection around forty minutes into Jerzy Kawalerowicz’s Austeria (1981). It’s an instant of the kind of visual poetry that enlivens the medium in the viewer’s mind and reminds us of the simple potency that film can have in the hands of a real master. A girl runs through a field, fleeing the sound of soldiers’ gunshots. The picture is desaturated, like many films involving war; her dress is bright white against a sea of brown fronds in a clearly perishing crop. Suddenly she stops; she’s been hit. And Kawalerowicz slowly turns the colour on to reveal a field of blood-red shrubbery, symbolically painted by her death. It’s utterly chilling and incomprehensibly beautiful. Austeria also proves a stark illustration of the danger that surrounds the characters taking shelter in the eponymous inn. A story of those knocking on the door of an inn leads our minds to biblical narratives and the innkeeper, Tag (Franciszek Pieczka), himself references one. With World War I breaking out in the surrounding countryside – situated on the border of Poland and Russia with an endless soundtrack of distant booming destruction – he sees his humble establishment as an ark of Noah. Inside he harbours travellers concealed from the horrors, including a Hungarian Hussar, refugees from the local town and a group of Hasidim in thrall to their leaders. Brought up in a largely Jewish community, Kawalerowicz sought to commemorate those that had died in the Holocaust through Austeria. 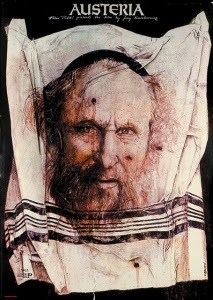 A collaboration with Jewish author Julian Stryjkowski to adapt his book of the same name, it was intended as a lamentation to traditions brutally cast asunder during the Second World War. The import of such a piece was hardly undermined when government interference in 1967 stopped the film from seeing the light of day until fourteen years later. The Six Day War engendered Anti-Zionist sentiment and the subject matter was deemed inappropriate. The finally rendered work is far nuanced than those censors might have conceived, however. The unwillingness of the Hasidim, or their strange mute Tsaddik, to acknowledge their plight, or the dishonour they do the body of the young woman lying in the next room hardly paints a flattering picture. When they lose themselves in song, however, the film manages to be at once disconcerting and irresistibly rhapsodic. Their behaviour has elements of grotesquery, but also a tragic finality which is confirmed in the closing sequence. Once again the apparently peaceful countryside is beset with booming, and this time a river rather than a meadow runs red. The superannuated are washed away in a destructive flood, and, in just one of its many spellbinding facets, Kawalerowiccz’s film stands in memorium. The 13th Kinoteka runs from 8 April – 29 May. The full 2015 programme, ticketing details and more can be viewed at kinoteka.org.uk. You can follow our coverage here.